Meet your new secret ingredient. 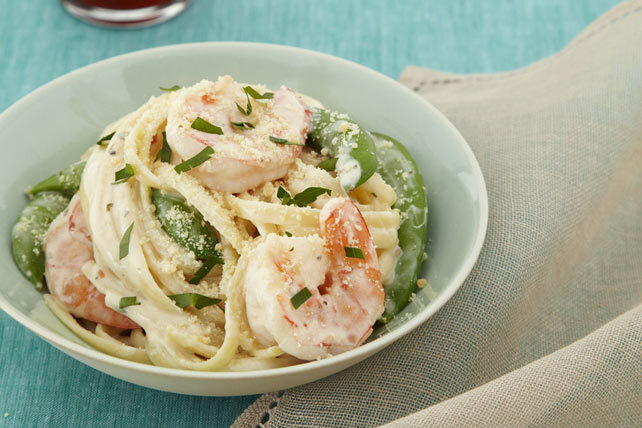 A creamy and flavorful sauce for shrimp and linguine is simple thanks to flavored Philly Cream Cheese Spread. Cook pasta in large saucepan as directed on package, omitting salt and adding peas to the boiling water for the last 2 min. Meanwhile, heat dressing in large nonstick skillet on medium-high heat. Add shrimp; cook 3 to 4 min. or until shrimp turn pink, stirring frequently. Transfer to bowl; cover to keep warm. Drain pasta mixture. Add to sauce with shrimp mixture; mix lightly. Top with Parmesan and parsley. It's great to have a bag of frozen shrimp in the freezer for a quick meal. Thaw frozen shrimp in the refrigerator, not at room temperature. Or, place the sealed package in a bowl of cold water and change the water every 10 min. until the shrimp are completely thawed. As with most shellfish, fresh shrimp should be cooked briefly to avoid a tough rubbery texture. If precooking for a recipe, add the peeled and deveined shrimp to a pot of boiling water and cook just a few minutes, until they turn pink and begin to curl. Drain and rinse under cold water. Prepare using PHILADELPHIA Chive & Onion 1/3 Less Fat than Cream Cheese.